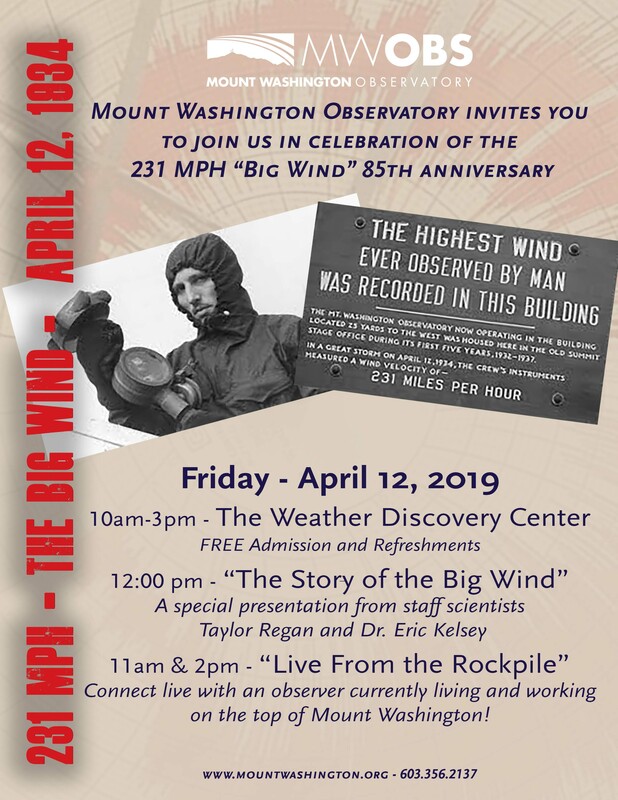 North Conway, NH – April 4, 2019 – The non-profit Mount Washington Observatory will be celebrating the 85th Anniversary of its record breaking 231 MPH wind at a free Open House at its Weather Discovery Center in North Conway, NH, on Friday, April 12, 2019. Events will take place between 10:00am–3:00pm. Guests will be invited to explore the museum and enjoy light refreshments while having the opportunity to speak with various staff members. At 12:00pm there will be a special presentation on the 231 MPH record wind “The Story of the Big Wind” presented by staff scientists Dr. Eric Kelsey and Taylor Regan. Additionally there will be two live video connections to the Observatory’s mountaintop weather station allowing visitors to meet observers Adam Gill and Ian Bailey and to see what is happening in real time on Mount Washington. Other staff will be available to share information about Observatory educational programs, research and membership. The 231 MPH wind remains on the record books as the highest wind speed ever observed by man. For more information and directions to the Mount Washington Observatory Weather Discovery Center, visit MountWashington.org/Events or call (603) 356-2137, ext. 231. ← Get ready for the White Mountains!